The project will deal with the activity of foreign diplomats in Romania (plenipotentiary ministers, the staff of legations and consular offices) in light of the individuals’ experiences of socialization and high-society/fashionable customs. Towards the end of the 19th century, Romania’s capital city became a significant destination in a diplomatic career, or a sort of springboard for ambassadors, to quote a widely used phrase of the time. The court of King Carol I placed a particular emphasis on connections with foreign diplomats. Diplomatic representation took mostly the form of audiences scrupulously prescribed in compliance with the existing customs and protocol, however personal affinities did not preclude, based on the current political agenda, any preferential relationships from being established. Berlin and Vienna — wrote the future Queen Mary of Romania — ranked first, behaviour to France was courteous, while Russia, albeit apparently unreliable, was treated in a most careful and polite manner, however it was a kind of politeness arising from concern rather than benevolence. England, remote at the time, maintained no close relationship with Romania, as the two countries shared few common interests. Foreign diplomats would discover in Bucharest a new world, a cosmopolitan aristocracy, unlike in any other Balkan capital city. “In Bucharest I was stunned — writes Petăr Neikov, new second secretary of the Bulgarian Legation (1909) — by the resplendent sights, while crossing, with my modest luggage in a coach, the side streets downtown, on my way to the legation. Crowds everywhere, as usually to be found in any European town, gold-embroidered uniforms, hats with magnificent feathers, swords sparkling in the sun, tail coats and top hats, medal-covered chests, fancy carriages with snazzy ladies, coaches of the headmost coachmen in town, trumpets, brass bands, flags… I just wondered if all this bode well for my service in Bucharest”. In this world that happily mixed the Western lifestyle with the Oriental traditions, foreign diplomats behave like a community of interests with a well-defined conduct, a world whose identity is not far removed from the identity of the officer or marine corps. Always away from their native country, they shared a communion of destinies, the social dimension of which ought to be recovered historiographically. 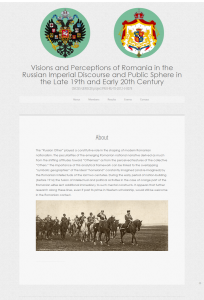 The “Russian Other” played a constitutive role in the shaping of modern Romanian nationalism. The peculiarities of the emerging Romanian national narrative derived as much from the shifting attitudes toward “Otherness” as from the perceived features of the collective “Others.” The importance of this analytical framework can be linked to the overlapping “symbolic geographies” of the ideal “homeland” constantly imagined (and re-imagined) by the Romanian intellectuals of the last two centuries. 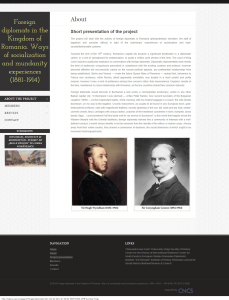 During the early period of nation-building (before 1914) the fusion of intellectual and political activities in the case of a large part of the Romanian elites lent additional immediacy to such mental constructs. It appears that further research along these lines, even if past its prime in Western scholarship, would still be welcome in the Romanian context. One of the most articulate manifestoes for the “establishment of a new research object of symbolic geographies” in Romanian studies was recently issued by the innovative Cluj-based historian Sorin Mitu. Though hailing from the tradition of “imagology” and the history of mentalities, the Romanian author insisted on the broader application of this model to topics in political and intellectual history. This has been partly accomplished already in the research of Sorin Antohi and younger Romanian-born scholars, such as Marius Turda. The foreign ideological models represented not only discrete instances of cultural transfer, but shaped and constituted the underlying frames of the national discourse. Antohi, for example, convincingly showed that the autochthonist canon constructed the discourse of Romanian specificity from imported ideological elements.